Head of the Jane Burn near Loch Marie looking towards Dusky Sound. It is incredibly difficult country. Some ‘easier’ areas (eg along the South Coast Track) are flatter and safer. There are both pigs and deer there. In NZ they have these excellent DOC (‘Dept of Conservation’) huts all over the place (roughly a solid day’s walk apart with a pack; all have a helipad) which make good accommodation at mostly $5 a night, eg in ‘the rut’ – which in those latitudes is late March-early April when the bush comes alive with the loud roaring of the red stags, or strange bugling call of the Wapiti. There is also a handful of us who have heard (much earlier in March) the echoing call of the moose – both sexes call, but differently. It is astonishingly loud: it needs to be for them to hear each other even with those huge ears over the vast distances. 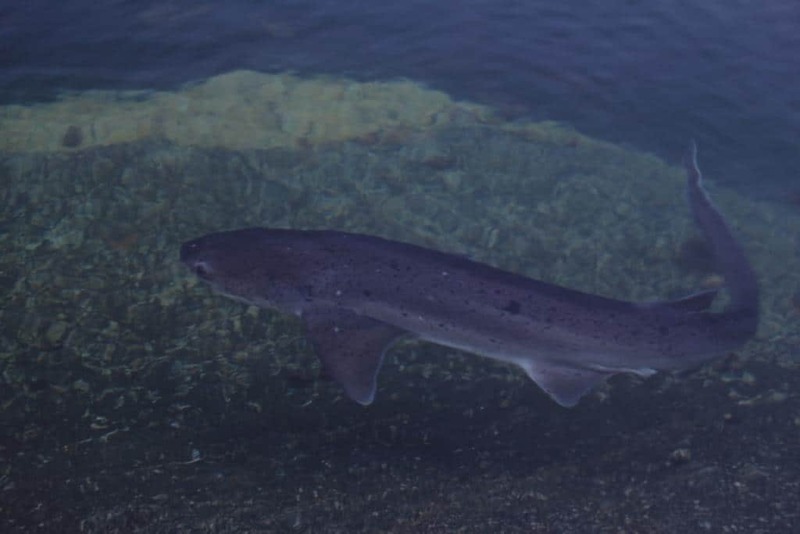 It is nothing to them to leap into one of the Fiords and swim several kilometres across to join up with a mate on the opposite side. Those vast long legs are excellent for forest travel. They can step over shoulder high logs which I have trouble scrambling over. I have found their thumb-sized droppings on the top of just such logs. They are big critters – nearly as large as a Clydesdale! There are often clearings along rivers (and on slips, see hillside). Lighting a fire in the huts is now more difficult as ‘environmentalists’ have mandated that all the old ‘pot belly’ stoves be replaced by these newfangled ‘pollution-free’ models which simply will not ‘draw’ and take a fire – and certainly will not boil a billy! Such is progress! Mind you the bush is so wet it is hard to get dry wood, which is pretty scarce nearby the huts anyway. With the new stoves installed I seldom bother. Some huts are supplied with wood. Usually they cost $10! Everywhere you point the camera is this beautiful serene forest. The ‘roar’ is the best time to go as that is when the Kiwis are out in the bush outnumbering the hordes of backpacking tourists, so there is opportunity to make some useful contacts with them, swap hunting stories, perhaps invite them across to Gippsland for reciprocal visits, etc. These guys really know how to hunt deer. High up on the tops in odd spots there remain a few Thar and Chamois, but not many. The best places to take the reds is near the leatherwood fringe of the snowgrass treelines which universally reek of stags, near forest clearings along river bottoms, clearings near the sea, on newish slips etc. In the roar, it is much easier to take stags in forested areas as they will come to your call much like puppies! It is a good idea to have a blaze orange hat though as fellow hunters also sometimes come to your answering call, as has happened to me a couple of times! Not the sort of contact you necessarily want to make with Kiwi hunters – though I am told an Aussie trophy on the wall is highly valued! So, beware! As I say, there are morasses. Many places have astonishing morasses which are something to avoid. It is very wet there (over 10 metres of annual rainfall), so if you sink into one of these beauties, you may disappear from sight. The going is rough enough in lowland forest and along river bottoms, but when you head up the ‘Burns’ which fringe the fiords or begin to climb the walls of the fiords themselves it is hard to believe. But this is where the moose are. You need to remember that fiords were carved out during ice ages; ie they are the remains of glaciers, so their sides and bottoms are one vast moraine field. A nightmare jumble of giant boulders which, over the years have more or less filled with soil and debris – but there remain deadly moraine holes you may slip down in to your detriment, or death! I have slipped suddenly down into one which was head high. Now I walk carefully, trying to test whether the ground will take my weight each step; you need to step carefully ever ready to throw yourself forward or backwards if you feel yourself falling. Above (and below) the treeline, the going can be very steep. Above the treeline is much easier as you can much better spy out the ‘lay of the land’, but the going is frequently precipitous and the ground loose or shaly and prone to awesome slips. Getting ‘bluffed out’ on forested slopes is far too easy. This happens when your descent is interrupted by a perpendicular fall – if you proceed! You know how much easier it is here to follow a ridge to the top than to follow it to the bottom. How many times have you ended up in the side gully rather than the main stream unless you pay close attention? Over there the ground is much more riven. There are innumerable ‘gullies’ so that you very frequently cannot find your way back down. You often have to re-ascend and search for another route. You must always be prepared for a night (or two) out. The worst thing you can do in such a situation is panic or hurry. Or worse risk a dangerous descent. Much better to camp out. Of course that is not easy on steep slopes. 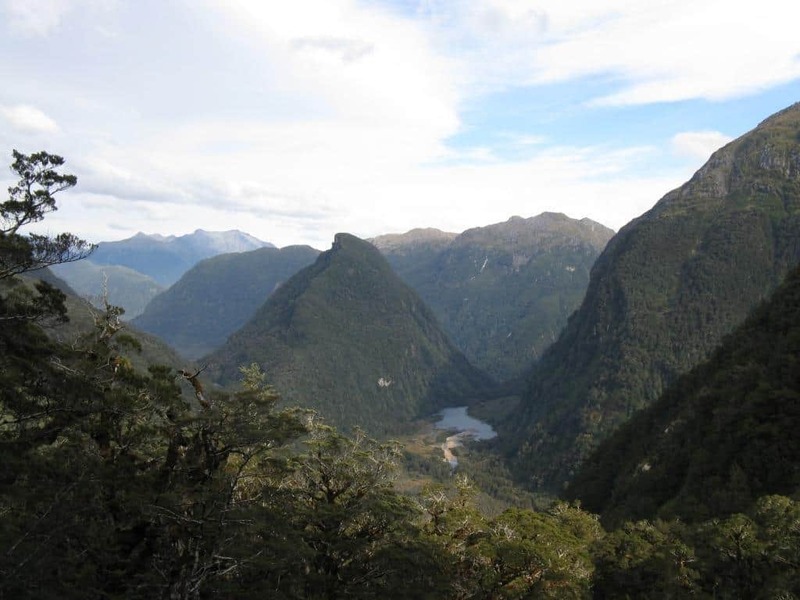 In Fiordland you will only manage to travel a fraction (1/4?) of the distance you would normally make in Gippsland. Lake Roe hut. A good spot to base yourself (but no firewood). Plenty of deer hereabouts, and some easy walking along the tops with beautiful views. In NZ I always carry a hammock. There are, after all plenty of trees. A hammock swung between any two trees makes a flat spot out of the worst slopes. 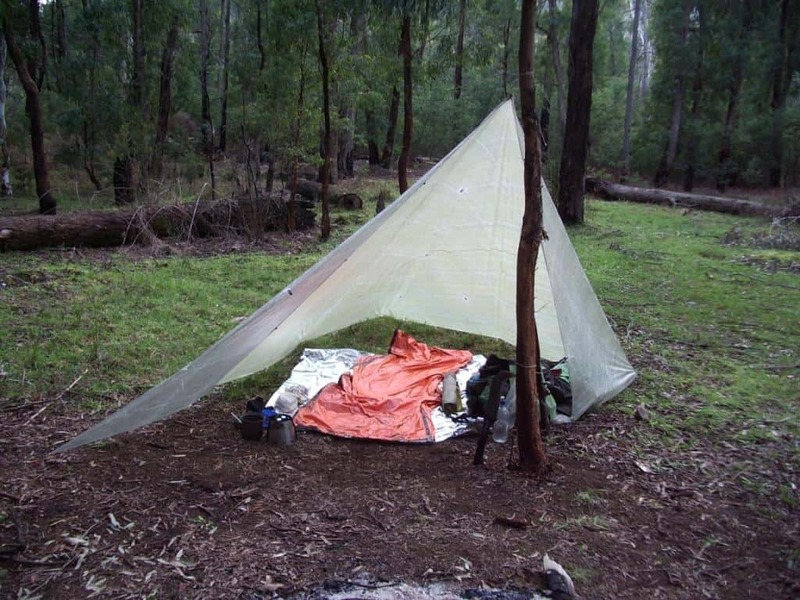 In Oz a 7’ x 7’ tarp will usually suffice. In silnylon such a tarp weighs less than 250 grams (with tie-outs). In .5oz/sq yd cuben fibre the same tarp weighs less than 100 grams! In NZ I would go for at least an 8’ x 8’. The lightest hammock (the ‘Nano’) weighs 160 grams including dyneema suspension cord (Hummingbird = 147 add suspension). Where it rains a lot, I would probably opt for a slightly larger tarp. We have a home-made cuben tarp with ‘storm-doors’ at each end which will keep you dry in the worst downpours and which weighs 200 grams. This is what I usually carry in Fiordland. If there are two of you, it is possible to swing two hammocks under one tarp, but you need to ‘boost’ the lighter person into the upper hammock. My wife is small enough I can manage this: http://www.theultralighthiker.com/hammock-camping-double-bunking/ More about hammock hunting here: http://www.theultralighthiker.com/hammock-hunting-till-dark/ I have a new way to swing two people under one tarp here. Cuben fibre comes in slightly narrower widths than ‘normal’ cloth (eg silnylon, etc = 5’ wide; cuben = 4’6’), so you can sew/tape two pieces to make a rectangular tarp 9’ wide and long enough to completely shelter your hammock whilst allowing the ends to meet at the bottom (11-12’). You need to learn how (not) to tie a hammock to two trees. If you tie any ordinary knot, after you have lain in the hammock you will never get the cords untied! The trick is to pass the cord around the tree, then around itself, then around the tree again (at least three turns); then a simple running hitch or even tucking the end under one of the loops will hold it there, yet it will not lock up and be impossible to untie. If you are really concerned about the cord cutting into the bark you can protect it with a few short lengths of finger-thick twigs. Whoopie slings are a great invention. Cuben tarp pitched as a fire tent with one flap closed. The other great thing about a hammock and tarp is that being so easy to erect, they make a pleasant dry spot to stop for a break, a cuppa, lunch etc. It is quite delightful to be lying back during a rest stop in the comfort of the hammock while you wait for the billy to boil (on the Brasslite Stove) under the tarp. If you have a cuben tarp which is quite translucent (you can see right through it), the view is just delightful. Night-time thunderstorms viewed through it are quite spectacular. Like Tyvek it makes a pleasant drumming (reminiscent of a corrugated iron roof) in the rain. The birds are incredibly friendly, though rare. A satellite phone (or Messenger) is a must in NZ. Frankly I am astonished by the majority of folk here not having one. Other people squander $50,000+ on a fancy 4WD (frequently one unsuitable for off-road conditions!) and lots of other fancy gear (bizarre unwieldy, impractical camo clothing & etc) but cannot ‘afford’ even a 2nd hand sat. phone at maybe $600, which could so easily save their lives. Clearly their lives are worthless! The helicopter pilots are so good (and the ‘medevac’ so well organised) that half an hour after you call, you can be flying to hospital. I have had to call in a chopper for quite a number of folk over the years, including my wife! Be warned: they fly a few human bodies out of the Seaforth alone every year! Looking South into the Seaforth from near Centre pass – you can see how difficult some of the going is. 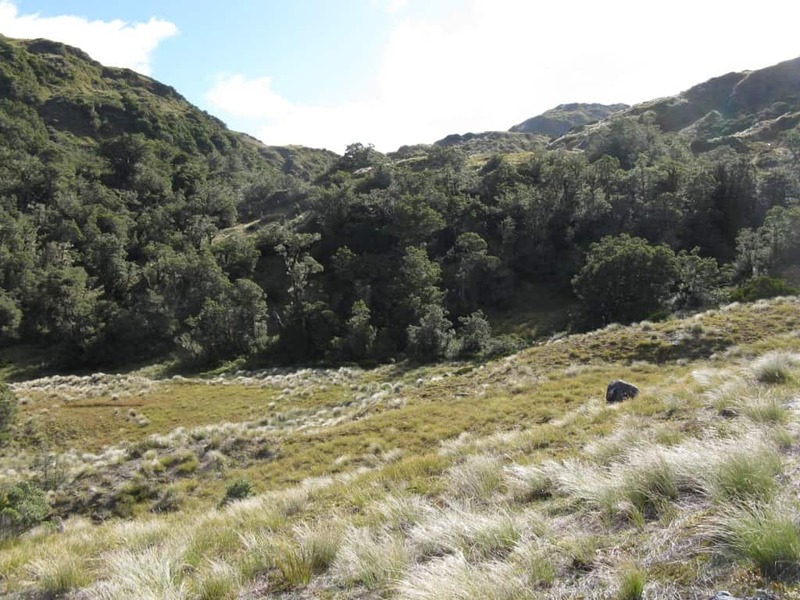 Imagine climbing Tripod Hill in the centre. 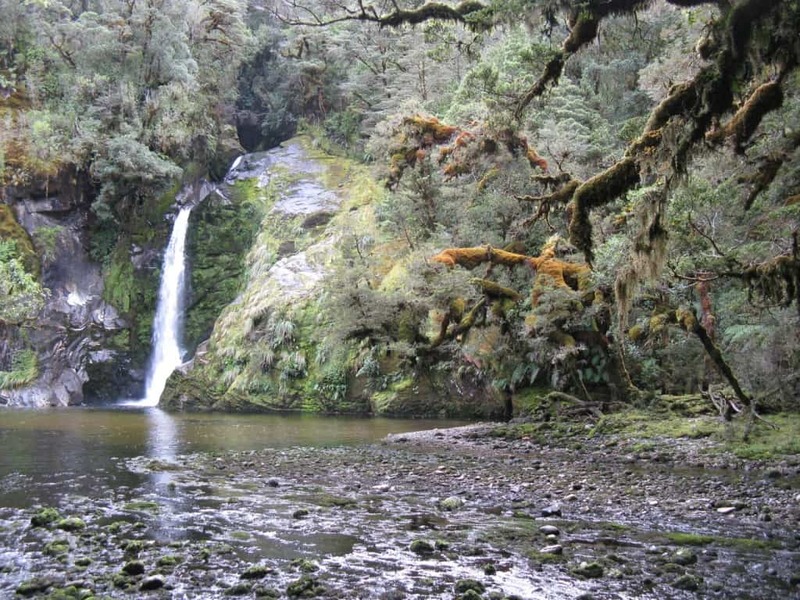 The silence of the Fiordland bush is astonishing. 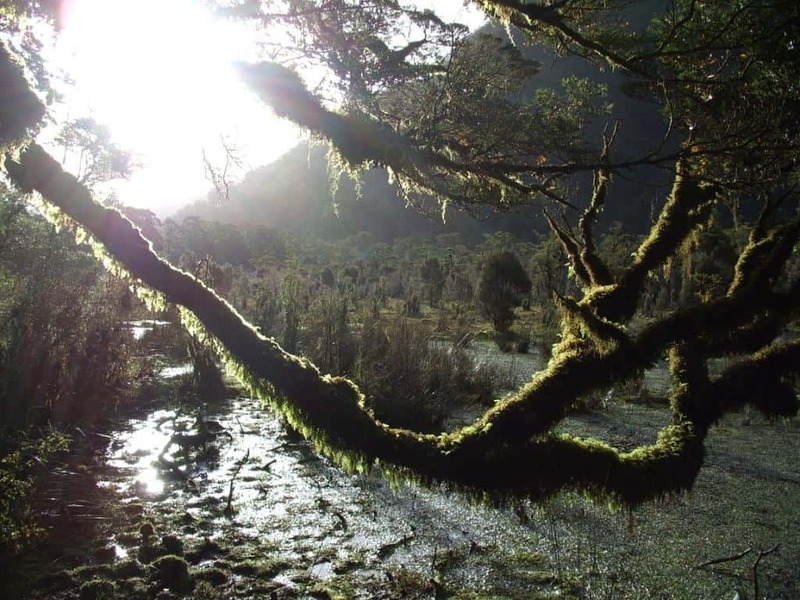 There is so much moss: it covers every surface in a deep carpet and shrouds the tree-trunks completely; it is also so wet, all sounds are muted save the ever-present sound of water, flowing, raining, dripping. Here we are used to the cacophony of the evening chorus and to birdsong as so constant a companion we are scarcely aware of it. 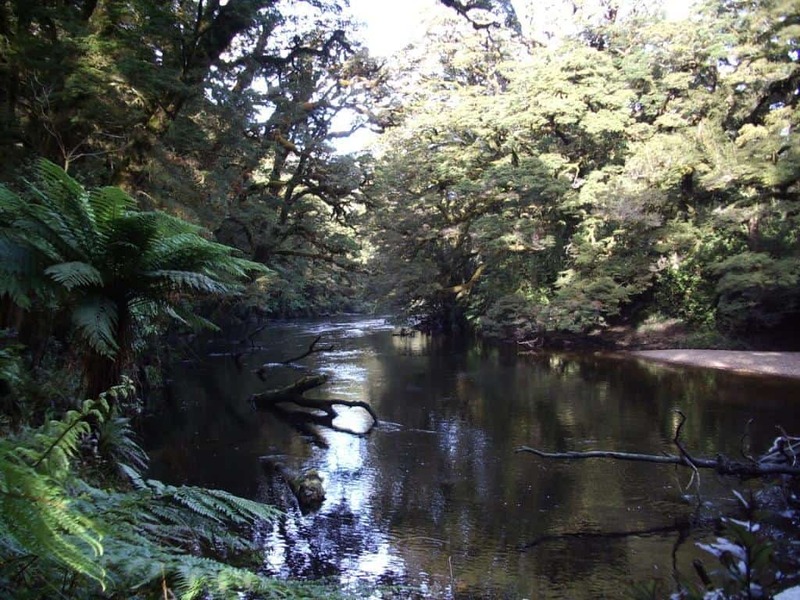 In Fiordland the stoat and possum has reduced birdlife to a spectral presence, a brooding silence. Less than 1% of 1% remain. They never had anything like the avian richness we are used to (close enough to a thousand species); they never had a hundred. Most are so terribly rare you will never see them. 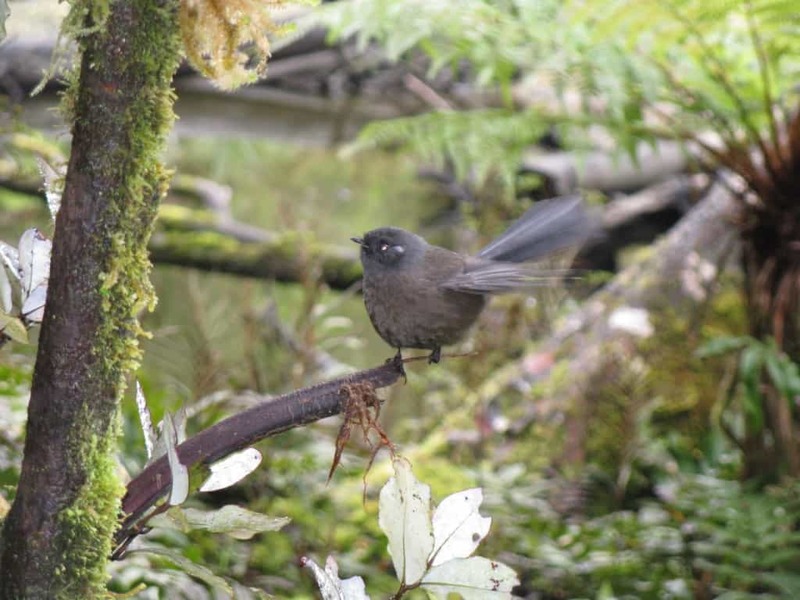 The fantails and robins are the most common; they are even friendlier than they are here. They will alight on your foot or pack, or on a stem within inches of your face. It is so silent, I have been working up one side of a gully while my friend worked the other (as you do!) At one point I caught sight of him less than fifty yards away. Thinking to stop for a yarn, I blew as hard as I could on my Fox 40 whistle (louder than a 747 taking off! ), but the moss and the wet just soaked the sound away. He could not hear me. 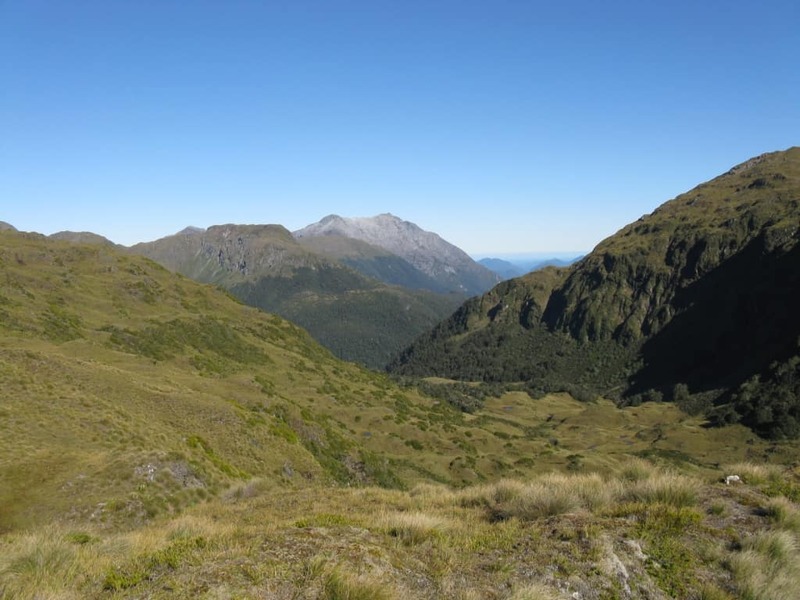 If you hunt with someone else (I usually don’t – which may one day be my undoing, particularly in Fiordland – you only die once! ), a radio is a good idea: I would invest in an Aloksak waterproof bag to carry it in. I spent all day (unsuccessfully) trying to get up past this waterfall. It is the topography that draws one back there: the utterly superb views (especially in the Fiords), mountains which seem to have just come off some master’s brush…and the wonderful, magical medieval forest; utterly unlike anything we see here. Regrowth fuschia on a giant slip, Kenneth Burn – a favourite moose food plant. An acre here had been moose trimmed last time I passed. Of course there are the innumerable sandflies. You simply must be prepared for these: http://www.theultralighthiker.com/insects-can-ruin-a-camping-trip/ You will not believe how many there are. If you fly in somewhere (eg to Supper Cove – recommended), and have forgotten to apply the repellent (I specified) before you land, the minute you step out of the plane/chopper every bare piece of skin will turn instantly black with them. People are reputed to have killed themselves to end the torture of them. I can well believe it. They are as large as mosquitoes. My suggested remedies work. Many others do not. Be warned. Be sure your clothing is impervious to sandflies! Regarding flying: if you have $10,000 to spare, spend it on flying around those fiords in a helicopter or float plane. You will never regret it. The views are just mind-blowing. One girl I had flown out with a badly injured knee said afterwards she was glad she had injured it or she would never have had such a flight. 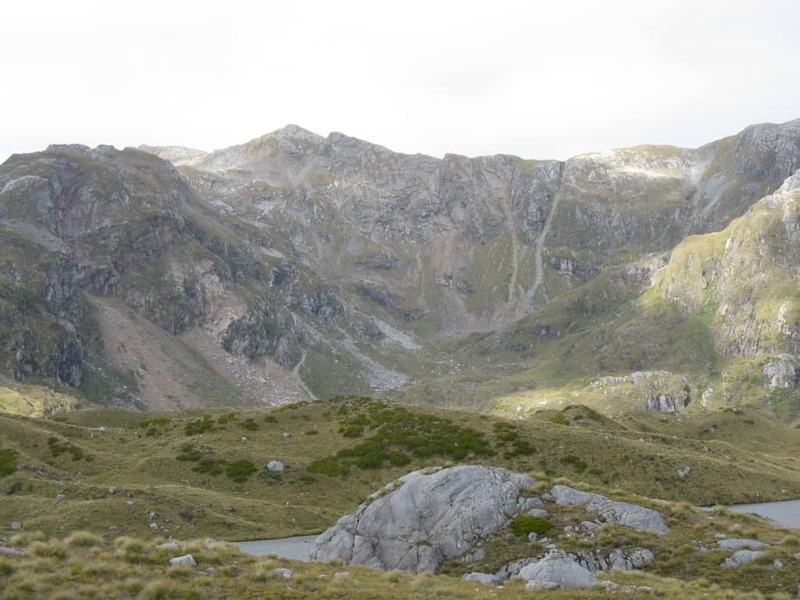 There are two main operators at Te Anau: Southern Lakes Helicopters (http://www.southernlakeshelicopters.co.nz/) and Wings and Water http://www.wingsandwater.co.nz/ . Both provide great service – but it is not cheap. The best way to economise is to share a ride. Often if you can wait a couple of days, they can organise to take you in or pick you up as a ‘back load’ – meaning that someone else is paying for the return journey. Seven Gilled Shark Supper Cove Hut. For your first trip there, I wouldn’t plan to take a gun. It’s just an extra 3.5 kg to carry. Plan to do a lot of walking and looking around. If you still want to hunt there, do so on a subsequent trip – or just buy a better camera. They are much lighter, after all. Good leatherwood/snowgrass fringes like this are a deer magnet. 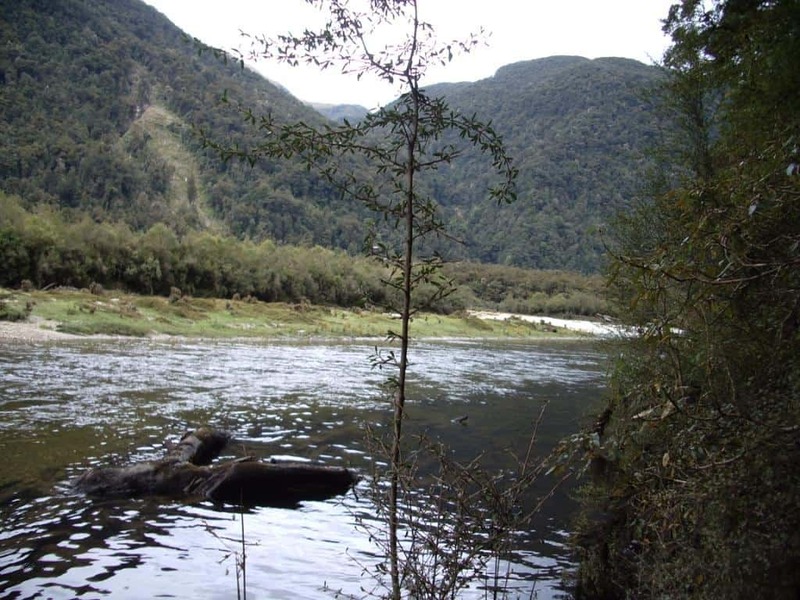 There are two jet-boat operators on the Wairaurahiri River in Tuatapere. You have to book. 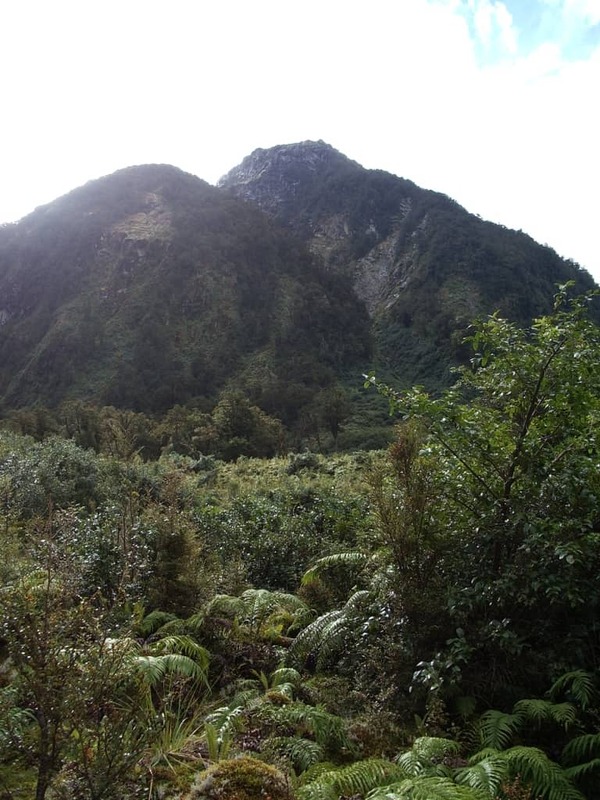 One also takes passengers up Lake Hauroko for the Dusky Track. A jet-boat ride down that river is absolutely wonderful. As is a stay in the delightful Waitutu Lodge where it joins the sea – a great luxury base for hunting, as is the lodge at Port Craig. Forget about the Shotover! There are approx six boats crossing Lake Manapouri each day (at the other end of the Dusky Track – most are taking people to Doubtful Sound; better than Milford!). You don’t have to book these. Just check when the last one leaves. 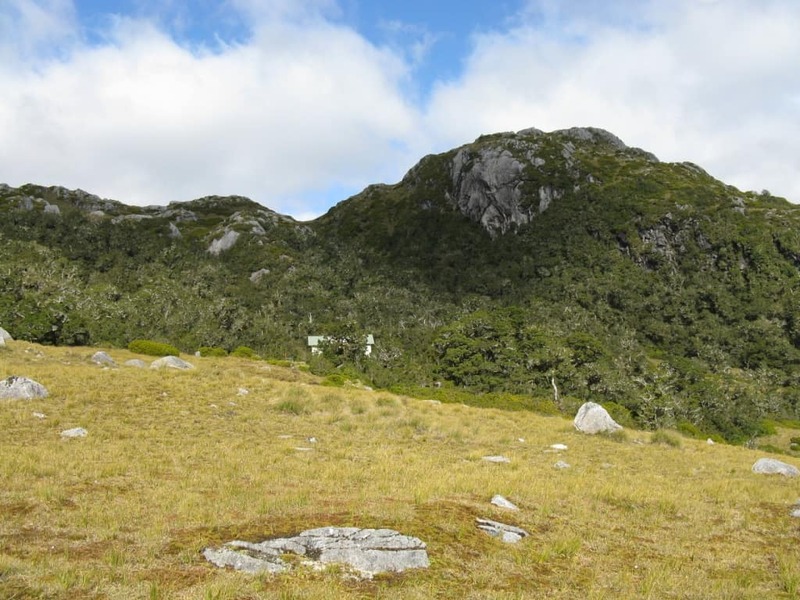 There is a DOC hut at West Arm if you miss it – but if you have just walked the Dusky Track, you will also miss your first cold beer for nearly ten days! It is a bit of a fiddle, but you can get a permit to export and import your gun, obtain a NZ shooters’ licence, apply for a balloted area & etc. I have done so in the past, but these days I would just as soon hunt with a camera, or just sight-see. That is my glasses case in a sandwich bag. 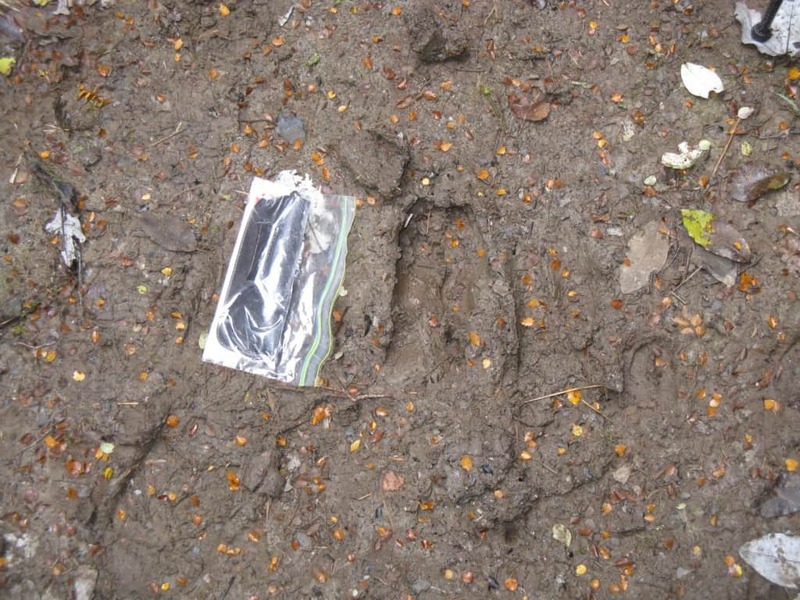 Next to it is a very large deer print – for comparison a red deer print on the right! If you want to learn more, you will notice that I have posted about the Dusky Track and the South Coast Tracks (especially) a number of times over the years. Scroll back through my old posts and you will come across some more information. Have a great trip!